Fumbles have dictated the first quarter of play. Both coaches have kept their game plans conservative, allowing their players to work out the nerves and get a feel for the game. On Navy’s first possession quarterback Kris Proctor had the Mids rolling until he fumbled it shortly after converting on a 4th down. Army recovered, but quickly returned the favor when star running back Raymond Maples coughed it up. 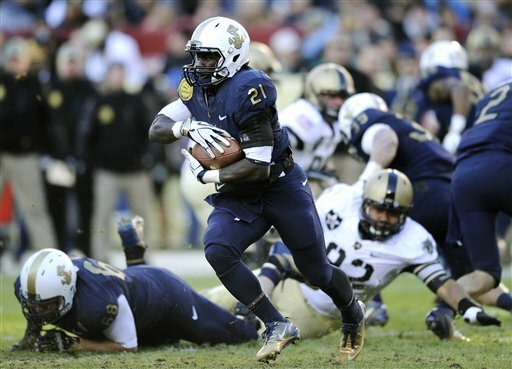 Navy’s Jabaree Tuani recovered setting up the offense. There was no mistake this time from Navy’s senior quarterback, who punched it in from four yards out to score the only points of the first quarter. Army has shown the ability to move the ball, but they can’t afford to give the ball up to Navy if they want to break this losing streak. Army ranks 109th in the country in turnover differential. Two Army players accomplished significant milestones in the first half. Maples eclipsed the 1,000 yard mark making him only the 15th Army rusher to do so. Junior quarterback Trent Steelman gained over 7,000 total yards in his career. He’s only the 4th Black Knight to accomplish the feat.